Space was at a premium at the former corporate headquarters of the Equipment Corporation of America (ECA). 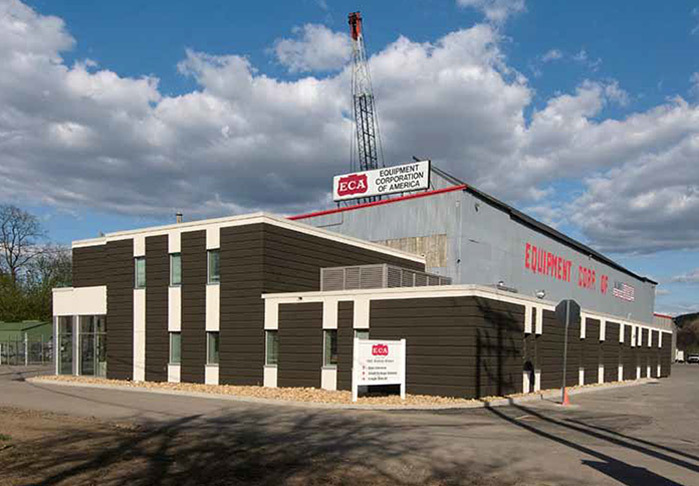 Founded in 1918, ECA, located in Coraopolis, PA is a construction foundation distributor that needed to renovate and add to their corporate headquarters. As the company continued to grow, the need for more offices, conference rooms and other meeting areas proved to be extremely important. Given that the building had not been updated since 1970 and some portions of the office actually dated back to the 1930s, BRIDGES worked hard to do away with the old office space and create a new, more spacious area. The complete renovation of the 5,300 square foot, two-story office included all new mechanical systems, a new floor plan, new shop office, kitchenette and restroom facilities. BRIDGES also constructed a new building entrance and a 25 person training room. In fact, since the project was completed in November 2014, sales and services technicians have already been trained in the new training room. Given that this building is the corporate headquarters, ECA employees are now able to video conference and communicate with branches and suppliers across the country and in Europe in the new space. "The folks at BRIDGES did a great job for us. Our weekly project meetings worked great to keep everyone up to speed and to promptly address any issues that came up. The entire project moved very smoothly," said David Hyland, Operations Manager, ECA. Led by project manager Gus Marquart, the BRIDGES team along with Superintendent Bruce Hooper, estimator Bob Lichvar, and project manager assistant Cindy Foglio worked together with David Hyland, Roy Kern, President, ECA and architect Mark Lighthall,from Plans Examiners Inc. to complete therenovation and construction on schedule.